NEO - Tropical Environment Desarrollando ConCIENCIA: Old Monkeys in New Habitats: The Biogeography of Terrestrial Biotas. Old Monkeys in New Habitats: The Biogeography of Terrestrial Biotas. I just returned last night (37 hours in transit!) from my first trip to Uganda. It was my second trip to Africa, with the first being to South Africa six years ago. The main purpose of the trip was to plan, with my colleague Lauren Chapman, some new studies on adaptation by fishes to extreme (low oxygen) environments. However, my first trip to any new location also becomes an adventure in natural history and photography. During these adventures, I was motivated to write a post based on a series of natural history anecdotes, which I will also seek to tie into a book I happened to reading at the same time. Following in Lauren's foot steps. My current bed time (and plane time) reading is The Monkey’s Voyage by Alan de Queiroz. 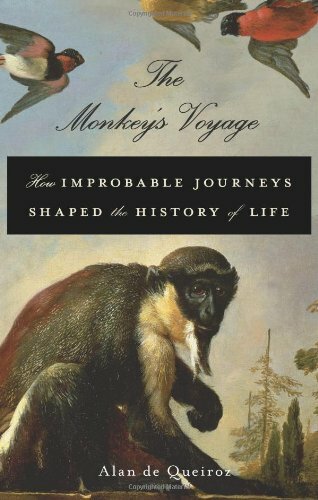 The subtitle of the book is How Improbable Journeys Shaped the History of Life. 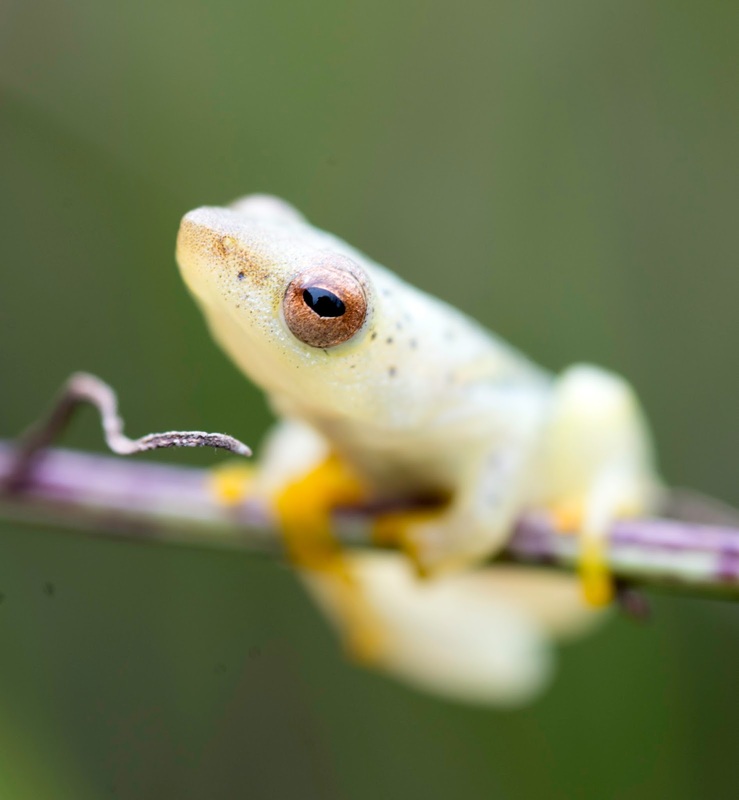 The goal of the book is to contrast old and new views of biogeography, the study of where species are found and why. The old view is that the distribution of organisms and faunas across the world is almost entirely shaped by vicariance events that sunder formerly contiguous landmasses. These events including land masses splitting through continental drift, mountain ranges rising, large rivers forming, and so on. Under this view, the species found in New Zealand, for example, are remnants of an early Gondwanaland biota that persisted (and diversified) following the isolation of New Zealand from a larger land mass that included Australia. By contrast, the new view is that the distribution of terrestrial organisms is shaped to a larger extent by rare long distance dispersal across even large ocean distances. 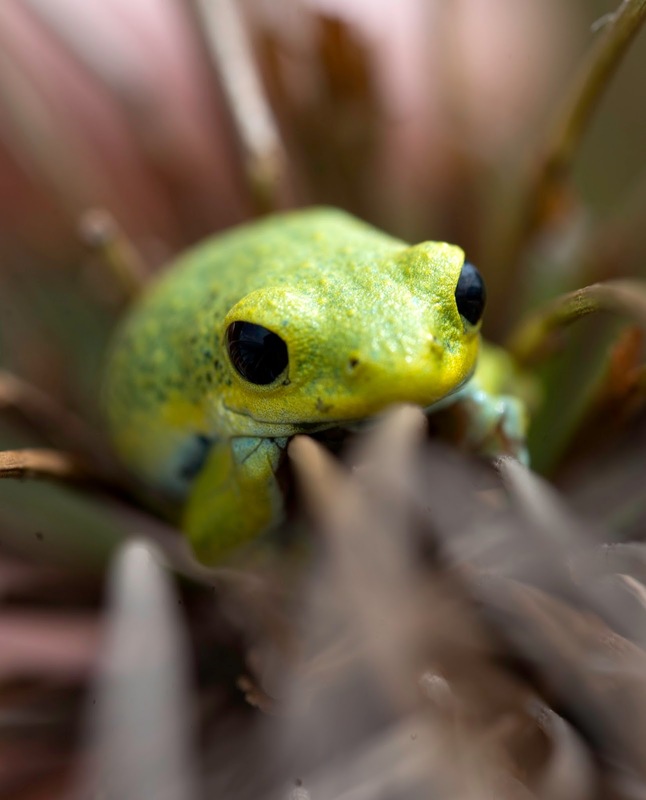 Under this alternative view, New Zealand’s fauna is mainly shaped by over-water dispersal from Australia long after the two islands split apart. (Interestingly, the new view is actually an even older view. Darwin spent considerable time studying mechanisms of long distance dispersal, although perhaps he wouldn’t have if continental drift had been known.) De Queiroz clearly favors the new view, marshalling extensive evidence that biogeography is strongly shaped by long distance dispersal. Reading biogeography in books is interesting but experiencing it in person in transformative. For the last 14 years, most of my field work has taken place in South America, including Trinidad, Galapagos, Panama, and Chile, alongside shorter trips to Brazil, Barbados, Roatan, and other locations. Now my recent trip to Uganda, combined with my earlier South African trip, has brought home in a personal sense the differences between “New World” and “Old World” biotas. 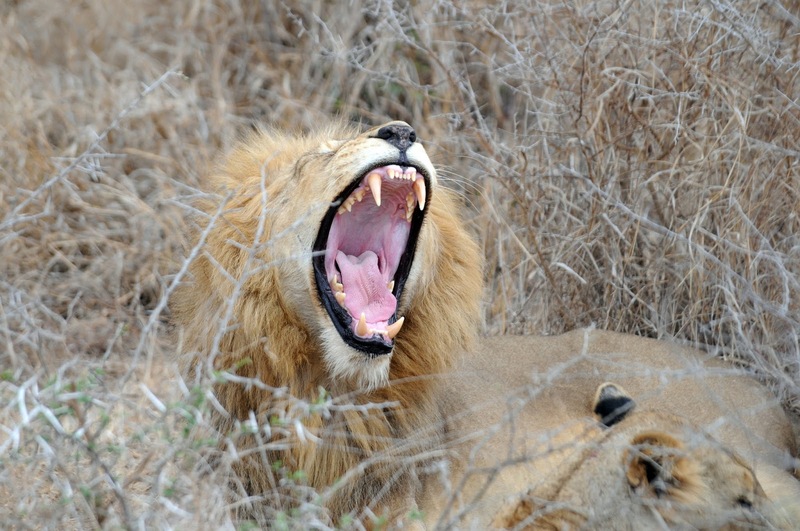 A South African lion showing off his dental array. 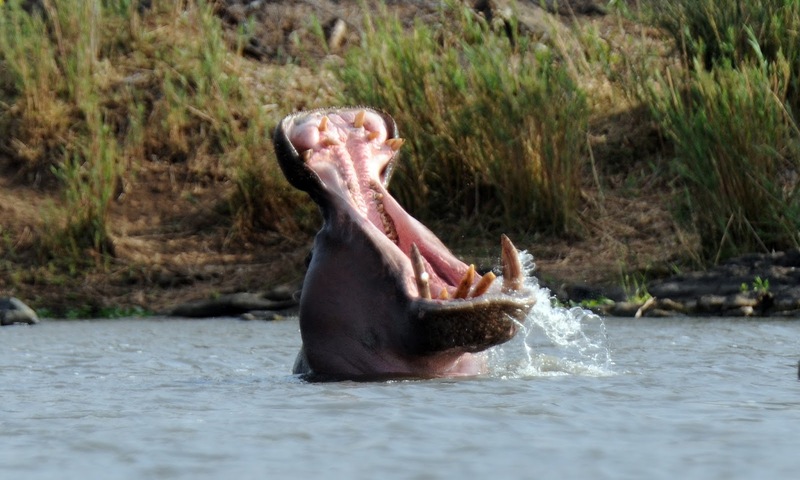 A South African hippo showing off his even more impressive dental array. The most in-your-face contrast, of course, would be the classic African large-mammal spectacles: elephants, hippos, buffalo, giraffes, lions, leopards, wildebeest, zebras, cheetahs, camels, and so on – most of which I have now seen in the wild. 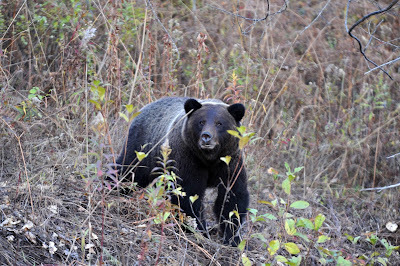 Although the New World certainly does have large mammals (moose, bison, bears, capybaras, tapirs, jaguars), they are not nearly as striking, abundant, or dramatic a spectacle. However, this contrast is somewhat disingenuous given that the New World had many similar forms (mastodons, mammoths, lions, sabre-toothed cats, camels) until their extinction in the Pleistocene not that long ago. (And, of course, bison recently did, and caribou still do, present huge migratory spectacles.) So, but for vagaries of our particular point in time, the large-mammal faunas of the two continents might not have seemed quite so different. 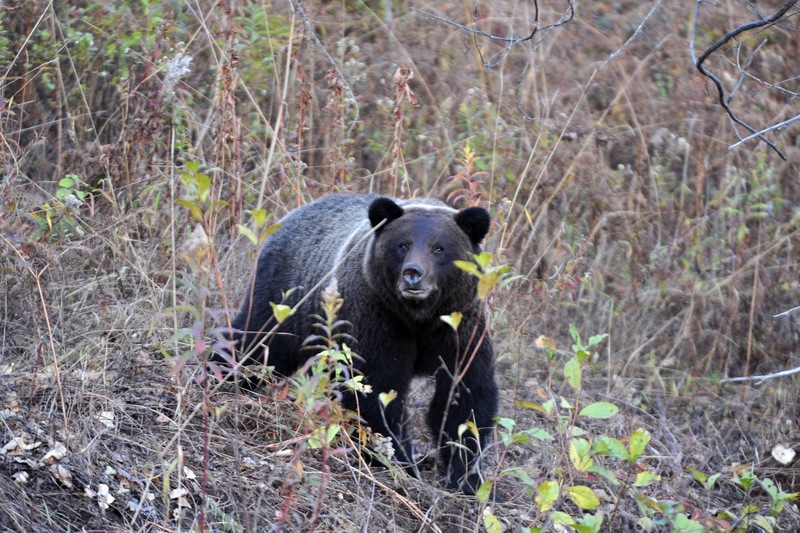 A brown bear from my cabin in Northern BC, Canada. 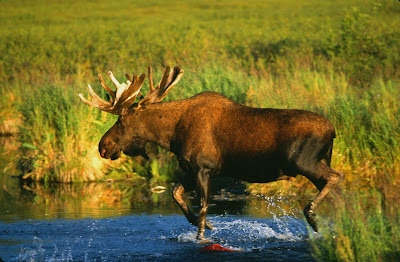 Yes, moose are huge - this one in Lake Nerka, Wood River Lakes, Alaska. A classic contemporary contrast is Old World monkeys (and apes) versus New World monkeys. The two groups differ in a number of ways, including various aspects of facial shape and – iconically – the prehensile tail of New World but not Old World monkeys. In Panama, I have been able to observe howler monkeys, white-faced monkeys, spider monkeys, Geoffroy’s tamarins, and others. 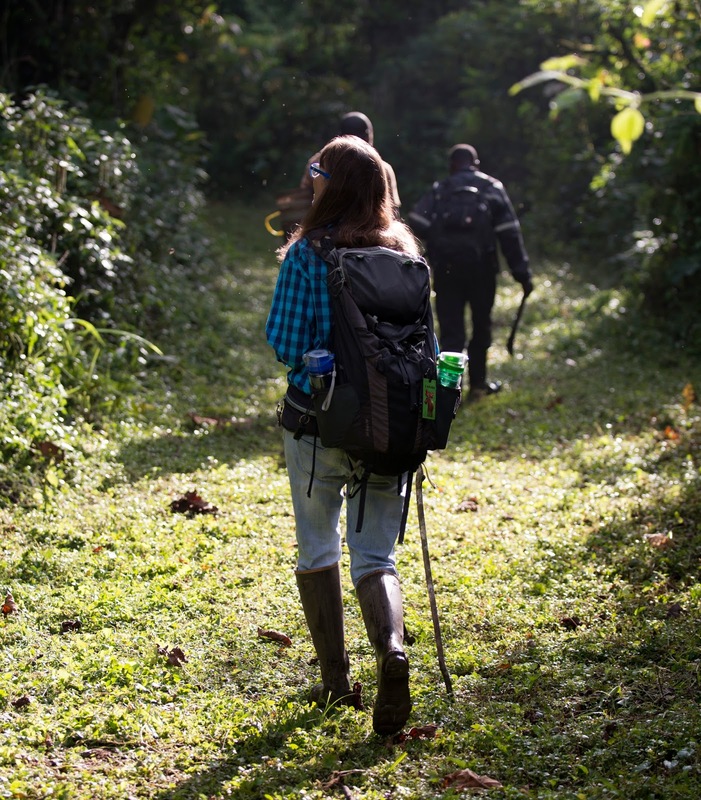 In Kibale National Park in Uganda, I was able to observe olive baboons, grey-cheecked mangabeys, blue monkeys, redtail monkeys, red colobus, black-and-white colobus, L’Hoest’s monkey, galagos (bush babies), pottos, and – the most amazing of all – chimps. (Kibale is said to harbor the highest primate biomass in the world.) Later at Lake Nabugabo, I saw vervets (more about these later), which I had also – along with baboons – seen in South Africa. Excepting chimps and baboons, and despite some differences in appearance, the two sets of monkeys strike one as superficially similar. They all move with varying degrees of frenetic activity through forest canopy feeding on a diversity of insects, leaves, and fruits. 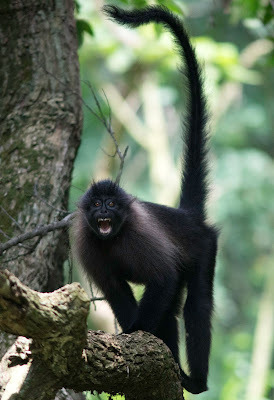 Thus, we here have a similar ecological set of organisms in the two worlds, with the new world monkeys having radiated from a single common ancestor colonizing the new world, perhaps by long-distance dispersal of just a few individuals from Africa (as argued by de Queiroz and others). Black-and-white colobus in Kibale National Park, Uganda. 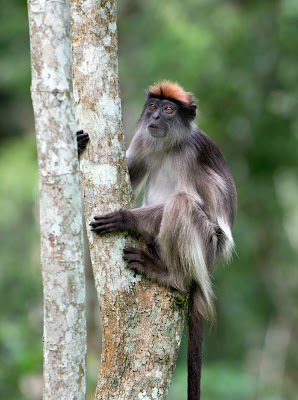 Red colobus in Kibale National Park, Uganda. 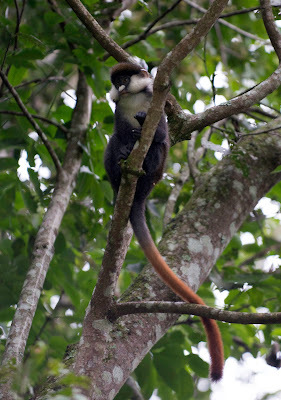 Redtail monkey in Kibale National Park, Uganda. 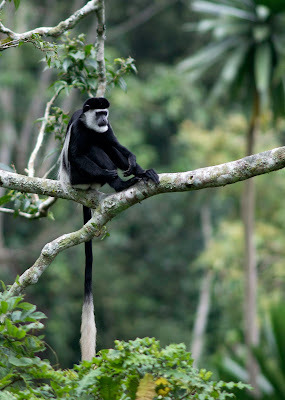 Grey-cheeked mangabey expressing displeasure in Kibale National Park, Uganda. 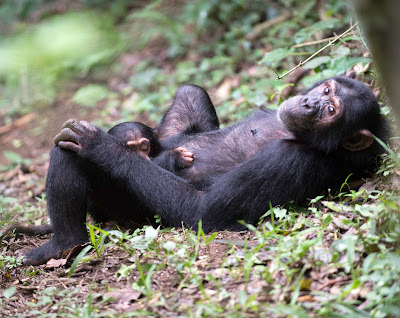 Chimp mom with sleepy baby in Kibale National Park, Uganda. For birds, the classic contrast is between hummingbirds and sunbirds. Hummingbirds, such a ubiquitous, striking, and engaging component of New World environments, are entirely absent from the Old World. Instead, the Old World has a large radiation of the nectar feeding sunbirds. 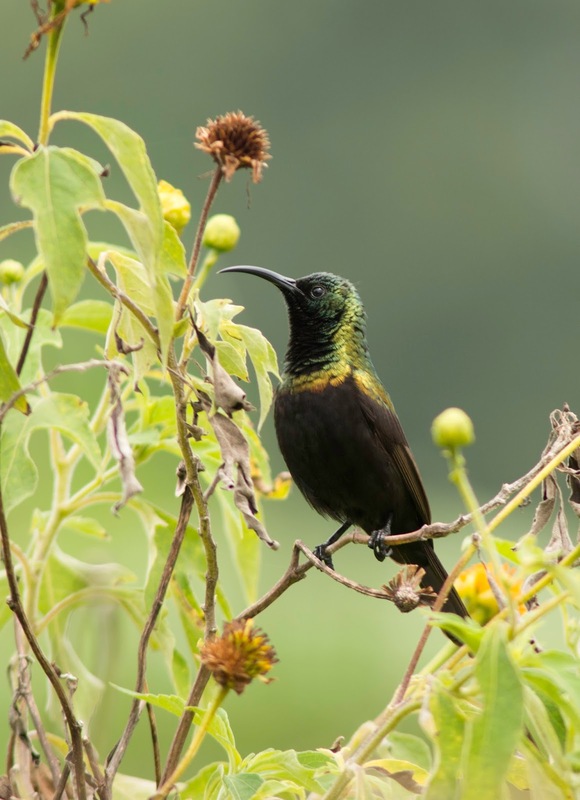 The first sunbird I ever saw was in Cape Town, South Africa. I was on Table Mountain composing a photograph of a flowering bush in the foreground with Cape Town in the background far below. In the midst of a sequence of photographs, a sunbird landed right in the middle of the flowers – almost as if I had planned for it. In Kibale and Queen Elizabeth Parks in Uganda, I saw more sunbids. However, despite the similar ecologies and exuberant colouration of both groups, which are not closely related, no one would mistake one for the other. For instance, the hovering flight of hummingbirds – perhaps their most obvious feature – is relatively rare in sunbirds. Bronze sunbird, Kibale National Park, Uganda. Lake Nabugabo frog #1, which I still haven't taken the time to identify to species. Lake Nabugabo frog #2, which I still haven't taken the time to identify to species. Lake Nabugabo frog #3, which I still haven't taken the time to identify to species. 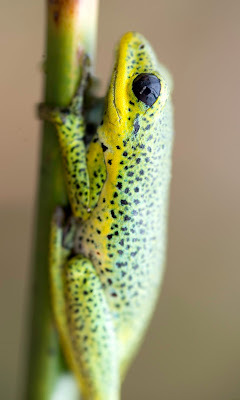 We later visited another part of the swamp and the same field assistant found another small-and-green-themed frog of seemingly yet another species. At this point, I was starting to feel incompetent in my ability to find critters and decided that I would find my own damn frog. So I went walking slowly through the marsh scanning blades of grass and other vegetation. Half an hour later, having still had no luck, I was about to give up when I saw a bit of movement near the water. “YES” I yelled, “I finally found one of the buggers” and, then, looking closer, I saw it was actually a finger-length chameleon. 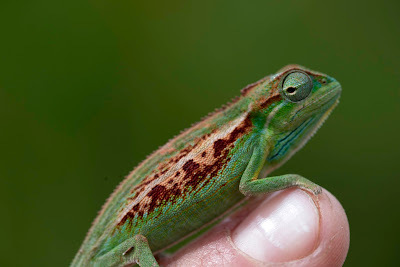 Even better – my first ever chameleon; and I found it myself (considerable boasting followed). 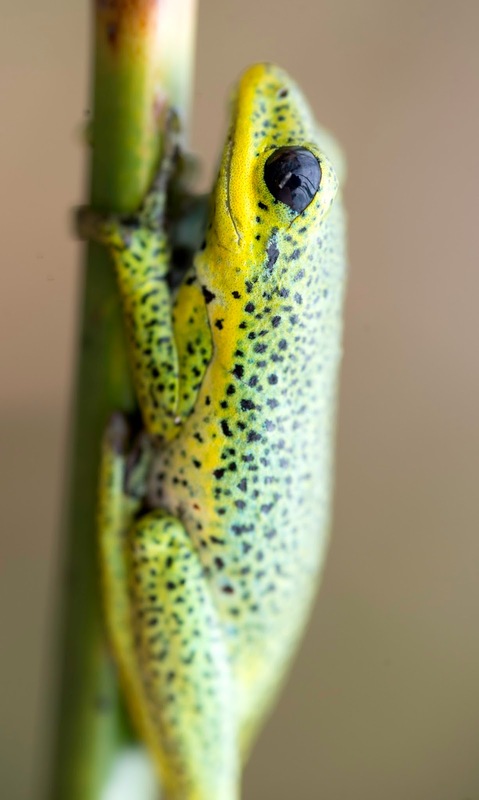 The next hour was spent taking 217 photographs of the chameleon plus additional shots of what appeared to be a fifth small-green frog species that another field assistant found. 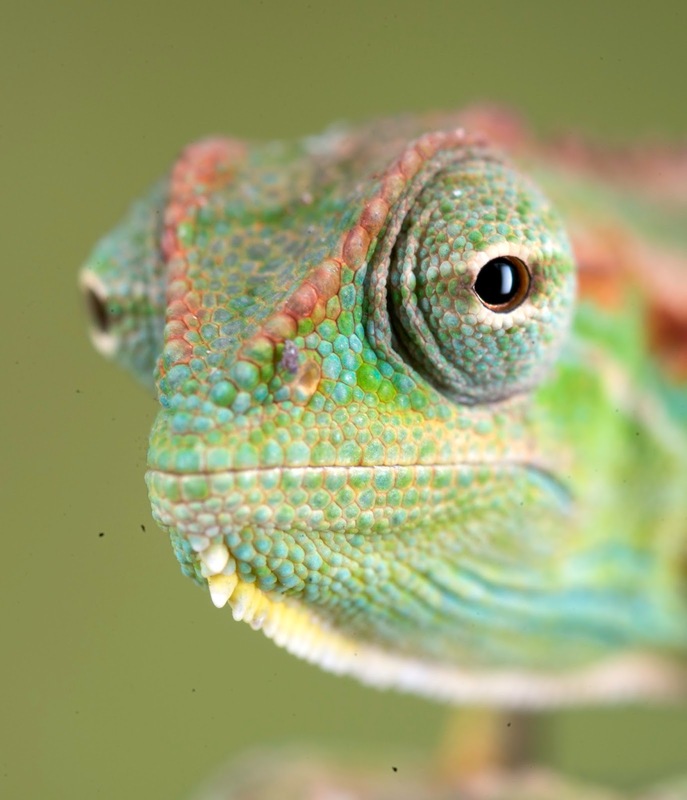 Chameleons are another major radiation in the Old World – especially Madagascar – that is completely absent from the New World, which instead has a radiation of Anolis lizards that are absent from the Old World. My chameleon. Found at Lake Nabugabo, Uganda. Getting a closer look at my chameleon. 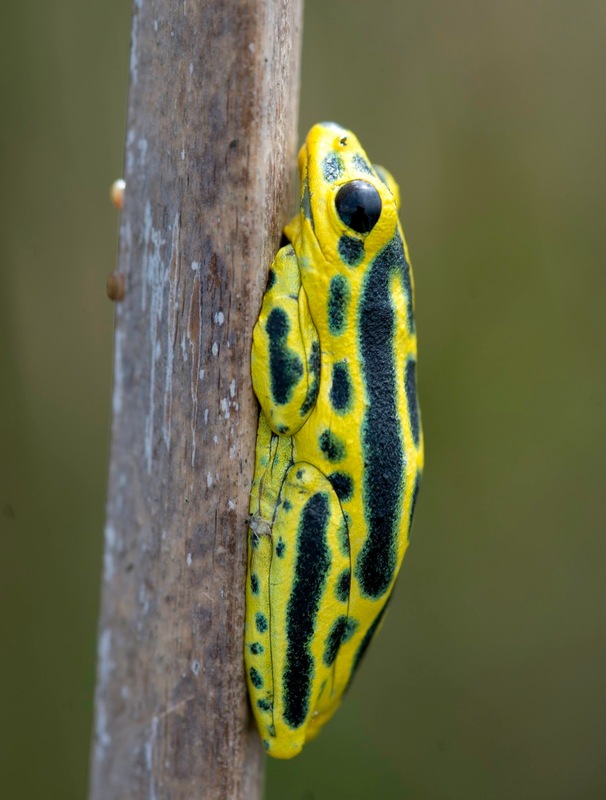 Found at Lake Nabugabo, Uganda. Lake Nabugabo frog #4, which I still haven't taken the time to identify to species. Lake Nabugabo frog #5, which I still haven't taken the time to identify to species. To these Old versus New faunal contrasts that I already knew, the present trip added another. After having seen and photograph most of the diurnal primates, Lauren took me on a night walk to look for the nocturnal primates. Almost immediately, we saw a potto, which I am told is not common, and I was able to get some photographs with a long lens and flash. What immediately struck me about the potto was its slow, branch-hugging movement; kind of like a sloth. Hmmmm, what about sloths? Sure enough, Lauren confirmed that sloths are absent from the Old World just as potto-equivalent primates are essentially absent from the New World (although the latter does have night monkeys). 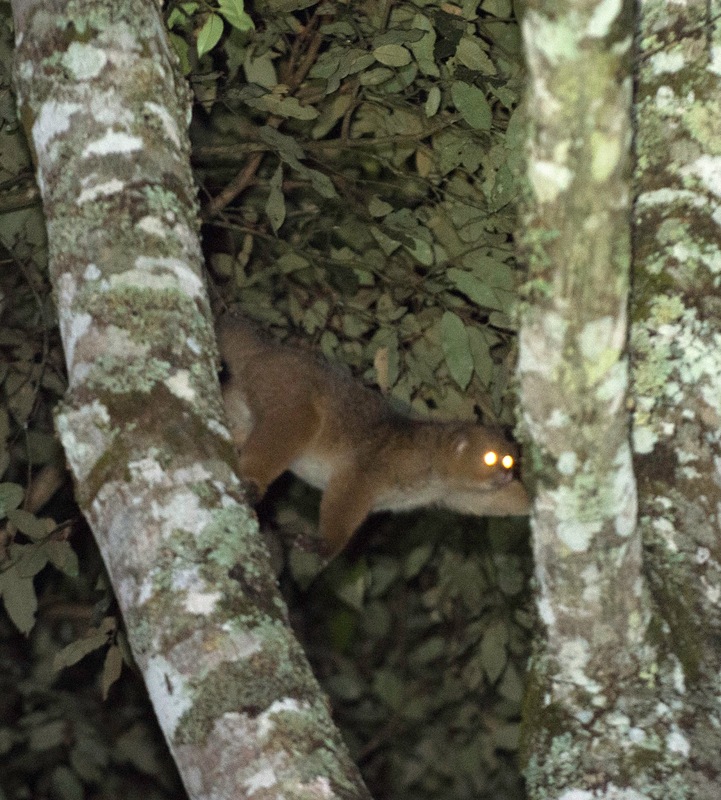 Potto doing its sloth imitation in Kibale National Park, Uganda. In this post, I have been a Natural History Tourist, giving my own superficial impressions of some differences between the two “worlds.” Although these impressions are based on relatively little experience in Africa, they made me ponder the biogeography debate I had been reading in de Queiroz’s The Monkey’s Voyage. Long distance over-water dispersal has certainly shaped the world’s fauna but vicariance ultimately seems more important through its role in limiting movement between land masses. On the one hand, long-distance dispersal does happen and is critical in shaping species distributions: without it we would not have any organisms on oceanic islands and many iconic organisms of large islands and continents would also be missing, including perhaps monkeys in the New World. On the other hand, faunas differ so much from place to place that effective long-distance dispersal must be very rare and vicariance provides the dominant factor assembling many communities. I doubt de Queiroz would disagree with these points even though his book is very much focused on long-distance dispersal. Another way to explain the distinction is that long-distance dispersal is critical for explain why species ARE in particular places whereas vicariance is critical for explain why species ARE NOT in particular places. All of this brings me back, believe it or not, to vervets, the first monkey I ever saw in the wild. This statement might seem surprising if you remember that vervets are Old World Monkeys whereas I had worked in South America for eight years before visiting Africa. In fact, my first experience with wild monkeys – the vervets – was in 2003 in Barbados. Yes: Old World Monkeys on New World Islands! It turns out that vervets were brought about 350 years ago to Barabados and some other Carribean islands by slavers. I don’t think other monkeys are naturally found on those islands, at least not on Barabados, so this isn’t a lesson in what happens when the two faunas collide. But if they did collide, who would win? Are New World Monkeys “better” than Old World monkeys? (They have that cool tail!) Would New World monkeys win in the New World and Old World monkeys win in the Old Word (Local adaptation!) or vice versa? (Enemy Release!) 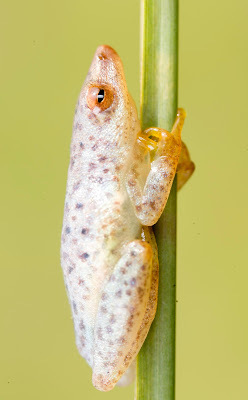 Of course, countless such experiments are being undertaken with other organisms as the field of invasion biology attests, but I don’t know any examples of recent human-mediated conflicts between ecologically-equivalent iconically-divergent faunas such as those described above. (Although placental dingos replaced, whether causally or not, the marsupial thylacine in Australia). How interesting it would be to bring hummingbirds to the Old World and sunbirds to the New, Anolis lizards to the Old and chameleons to the New, capybaras to the Old and hippos to the New, and so on. (Apparently Pablo Escobar, the drug lord, had a hippo herd that is now feral and expanding in Columbia.) Just think how much we would learn and how fun it would be to see the dynamics play out. Sadly, however, the likely ecological impact would exceed the value of the information gained thereby. I would much rather see Anoles in South American and chameleons in Africa, than I would like to find out who would win in direct competition in nature. It is too bad we can’t have replicate worlds, some for conservation and some for experimentation. 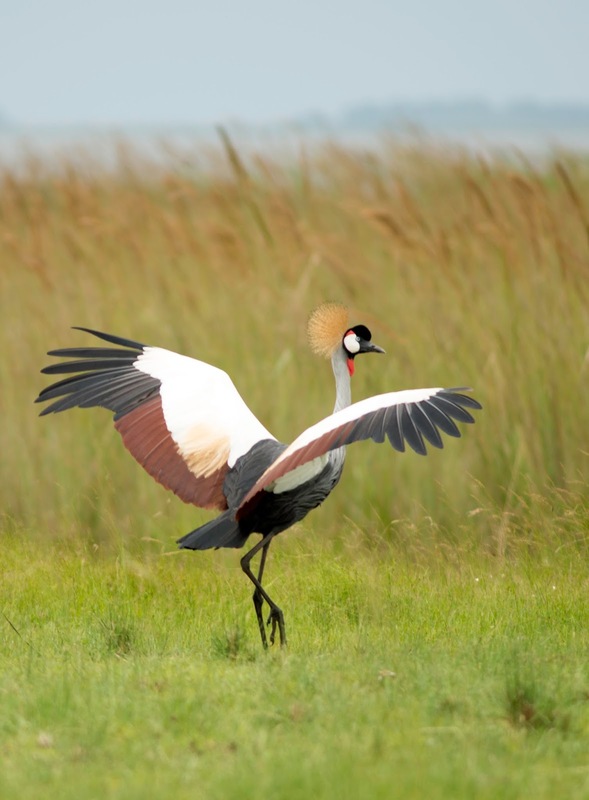 Grey-crowned crane at Lake Nabugabo, Uganda.